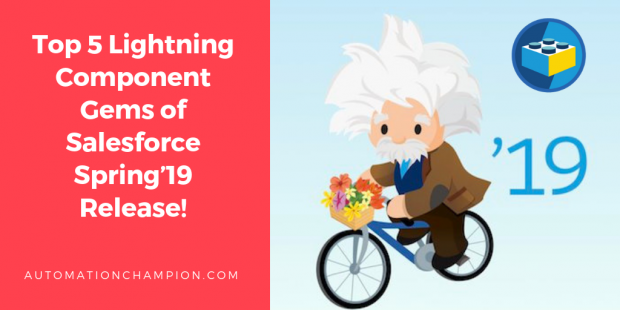 Top 5 Lightning Component Gems of Salesforce Spring’19 Release! The Lightning Component modern framework is a User Interface framework to develop dynamic web apps for mobile and desktop devices. As is the case with each release, the latest Spring‘19 release is packed with rich features including, the newly added Lightning Component features! Currently, Spring’19 release is available under the pre-release program. Sandboxes will be upgraded on 4th and 5th of January. As a result, your organization will get the look and feel of Spring’19 release. 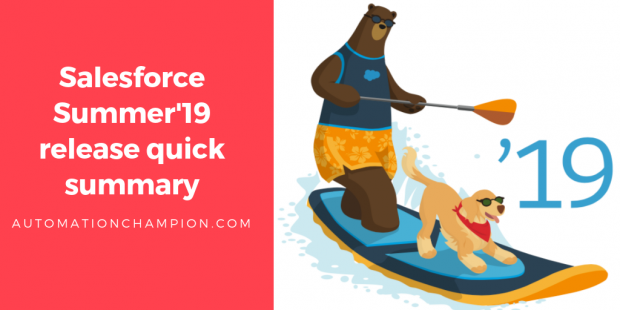 In case you have not read the entire 429 pages of Salesforce Spring’19 release notes, check out Spring’19 release quick summary and the Spring into Top 10 Lightning Experience Gems of Salesforce Spring’19 Release! written by me. I combed through the release notes and highlighted the added capabilities to the Lightning Component features. Believe me, it was hard to stop at just five! To kick things off, here is my take on the coolest Lightning Component features from Spring’19 release. Lightning Locker supports the new Lightning Web Components programming model.